Considerations when designing approaches to assess and support advocacy capacity. My sister spent nearly a decade trying to “build” my knitting capacity. She wanted to impart her passion and skill for knitting on me; I was mildly interested. 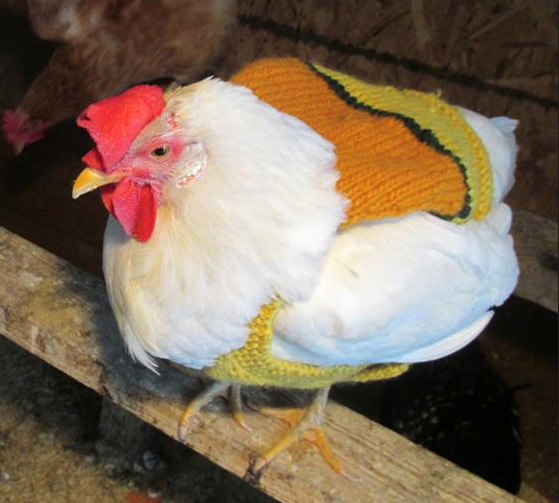 She knits everything, including this darling chicken sweater. (She lives in a very cold place.) At this point, I knit a passable scarf at a leisurely pace. And that’s just fine with me. I keep this experience in mind when working with civil society organizations and their funders who are interested in learning about using advocacy to advance their goals. Roughly a quarter of international development assistance funding is spent on “capacity building”—training and technical assistance—but with mixed results. So, it is wise to give attention to better understanding how these efforts are working, what benefits emerge as a result, and for whom. Defining advocacy: What concept of advocacy is being supported? Identifying essential capacities: What skills, resources, and supporting conditions need to be in place to enable that advocacy, and are they in place for the organization or coalition engaging in the advocacy? Aligning needs with support: If the necessary skills, resources, and supporting conditions aren’t in place, can their development be supported by external sources? Assessing quality of support and engagement: Is the support provided in response to those needs of good quality, appropriate, and relevant? Does the organization participate in a way that enables it to learn? Emphasizing durability: Does the organization have what it needs to apply that learning? Each of these issues has some variables programmers and evaluators can consider, as outlined in the table. What concept of advocacy is being supported? 2. What skills, resources, and supporting conditions need to be in place to enable that advocacy? Are they in place for the organization or coalition engaging in the advocacy? 3. If they aren’t in place, can they be supported by external sources? 4. Is the related support provided in response to those needs of good quality, appropriate, and relevant? Does the organization participate in a way that enables it to learn? 5. Does the organization have what it needs to apply that learning? When addressing these questions, evaluators need to give attention to whose perspectives are represented, how well aligned they are, and whether supporting conditions are in place to enable application and use of those capacities. We also need to tackle assumptions head-on, such as that an organization being supported agrees with the needs identified, invests in solutions, and is committed to applying what it learns. What is the evidence connecting advocacy capacity support and effective advocacy? What do we know about effective ways to support an organization to develop its advocacy capacity? While advocacy capacity support often focuses on technical skills, like effective media tactics, is it possible to support less tangible factors that we know affect an organization’s ability to use advocacy as an on-going strategy to advance its goals, such as leadership and adaptation? What other questions will help us improve how resources for capacity support can best be applied to sustainable, durable change?